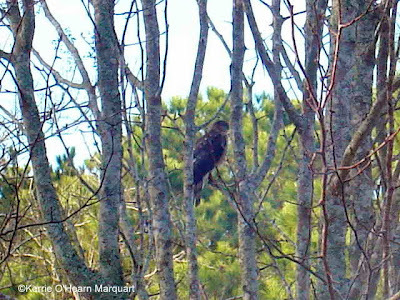 I almost missed this one a few minutes ago when a squirrel actually came and chased the hawk away! I was inside with my little digital camera when I saw him while sitting at the computer. This is as close as my little camera could zoom through the window and I dared not go outside for fear of missing him altogether! 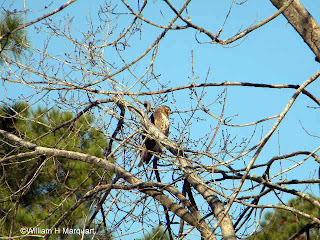 He is a Broad-winged Hawk: they measure 13 1/2" to 19" in length. 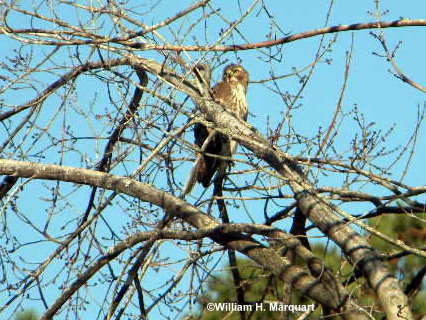 I could see his broad banded tail and colors and his bill was shorter than some of the larger hawks. I am always so thrilled when I see one of these creatures! The novelty never wears off for bird lovers! JUST REMINISCING ABOUT THE FAMILY BEFORE THE NEW YEAR. SHARING OLD PHOTOS OF MY FAMILY.... On the right is my Dad with his Father, Phillip O'Hearn that I never got to meet as he passed before I was born. 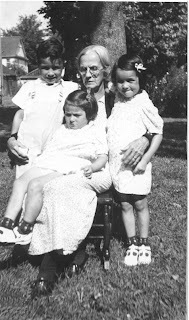 Grandma Catherine O'Hearn that I never knew. 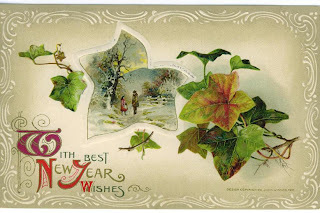 happiness, good health and prosperity. 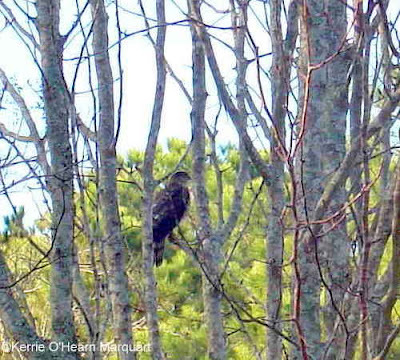 WHAT COULD BE MORE BEAUTIFUL THAN SPOTTING A HUGE RED-TAILED HAWK HIGH IN THE MAPLE TREE ABOVE THE LAKE? THIS MORNING'S VISITOR WAS SPOTTED BY MY DAUGHTER AND A LOT OF RUNNING OUT OF DOORS WITH THE CAMERA TOOK PLACE! Such excitement! My husband and Barbara were able to take several pictures before the hawk left his perch and flew to this side of the lake right over their heads! Profile among the branches of the Maple tree. 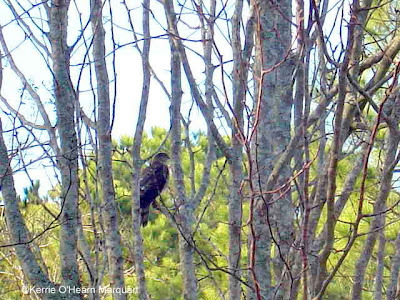 Red-tailed Hawk: Size: length 19-26 inches; wingspan 4 1/2 feet. 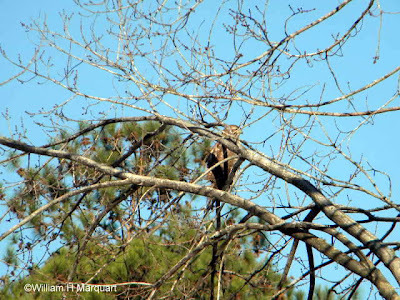 Red-tails hunt from the air and from exposed perches, such as tops of dead trees. Was this a great morning visitor or what!? Our backyard sanctuary has yielded visitors of all kinds including: raccoons, coyote, Red fox,Opposum, Mute swans, White Egrets, Great Blue Heron, Green Heron, Kingfisher, Blue Birds, Nuthatch, Titmouse, House Wrens, Carolina Wren, Flicker, Red-headed woodpecker, Mockingbird, Blue Jays, Mourning Doves, bunnies, squirrels, tiny green lizards and some hop toads no bigger than the end of my little finger! It is like being Beatrix Potter but without her artistic ability, ha! We love all the creatures who visit. 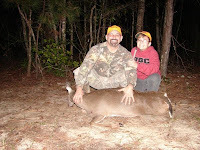 We moved here from a house we built after 9 yrs there because we wanted the peace and quiet of an over 55 neighborhood. We purchased a nice little home on a lake in this central community. The area was a natural nesting place for Canadian Geese, Swan, etc. 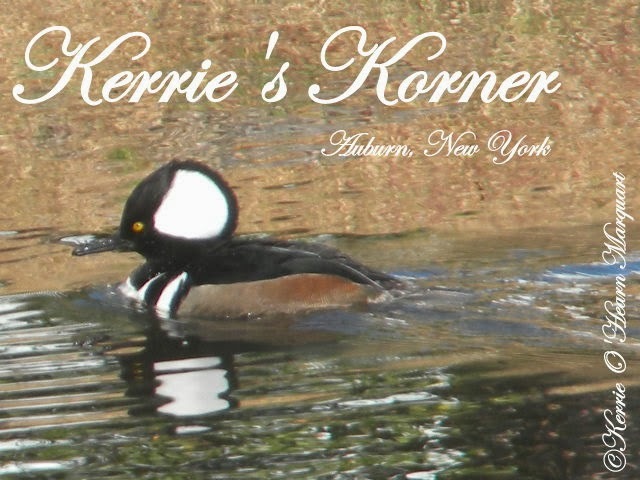 Although the community was built among many small lakes, it did not bother the wildlife at all and they continue to come every year with some staying all year long to our delight. On the other side of the highway going North from our community, is a golf course where we have taken bike rides on the path and seen Storks in the lakes at that location. 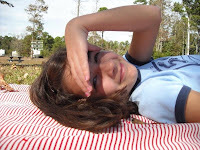 How fortunate we are to live in such a beautfull area here in Garden City/Murrells Inlet, South Carolina. Thinking of retiring? You would love it here! 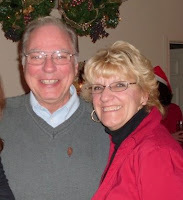 We came 21 years ago today long before retirement age-just stepping out in faith and have never regretted it! 'Nuf said! 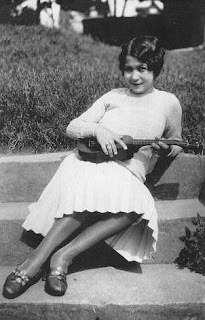 Please go to my Two Happy Blog (Link in Sidebar) for reminisces of my Mom who would have been 100 tomorrow. 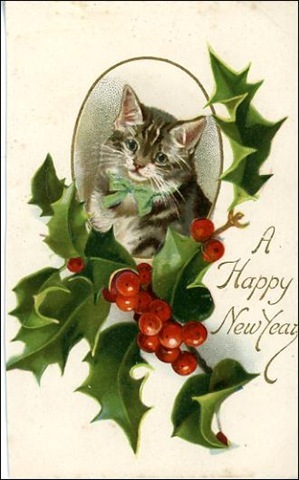 God Bless and wishing you every happiness in the New Year to come! 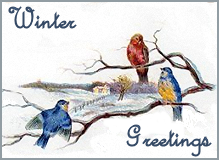 Thank each one of you for welcoming me into your homes through my blog and for all the enjoyment I have attained from visiting your blogs! I appreciate all of you who have supported us with your prayers and loving comments throughout my first full year of blogging! It has been a wonderful outlet and adventure for me. This is a poem I wrote for my brother Christmas 1994. I was recalling our childhood memories. For a price that Mama wouldn't dread. until the last carol we knew was sung. Were brought from the Aunts who always stopped. "You just missed Santa:, he'd tell! 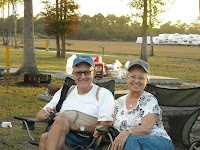 My husband had cancer treatment today as usual. Cancer never takes a holiday. But we were thankful that the nurses were smiley, efficient and loving. He gets a lot of attention whenever he has treatment and he is an exceptionally good patient. For the most part, they all love him as I do! 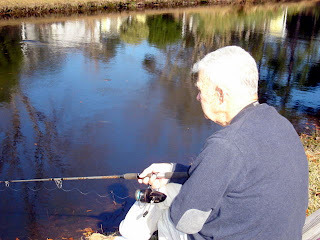 He takes it all in stride and continues on his now 4 yr. battle with Multiple Myeloma. I made lunch for him when we returned home and the sun is shining so he could not just go to bed to rest. He is out there fishing off the bank in the back yard in our little lake. He doesn't want to miss a day of sunshine, a moment of life. 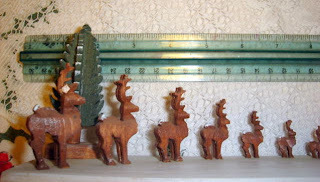 Please don't forget to visit my Kerrie's Krafts 3 blog to see our latest creations in wood. Check out the page saver for an aid in reading your paperbacks!! And also my Etsy shop! All links are in the sidebar-THANKS! 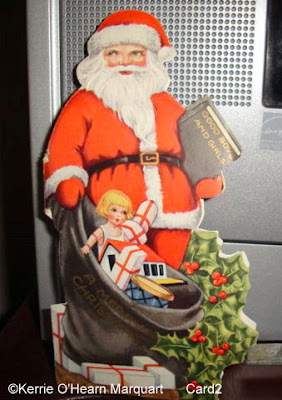 SHARING 2 OF MY VINTAGE SANTA CARDS. These cards have never been mailed. I bought them at an estate sale back in the 70's and they are from the 1940's. I treasure them and put them out every year among the tree branches on the tree. They are unique in that they have stories inside them and it is not the ones we typically know of nor have I ever heard them anywhere else. They are made in the USA and the backs are the backside of Santa. The Santa's have the kindest faces! 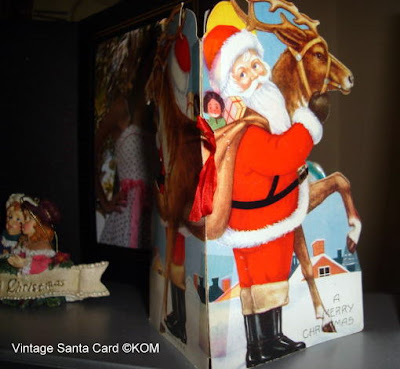 This one begins: "As good Santa Claus with his faithful reindeer drove out of the Milky Way, A bag of toys caught on a star point there, And tumbled right out of the sleigh. As it happened 'twas only an extra one that he wasn't going to need, But when you hear how it all turned out, You'll know it was lucky indeed." And then the story continues on 3 more pages. This one begins: "Did you ever stop to think, my dear, How busy Santa is each year Planning all the gifts and toys That go to little girls and boys? Dear Santa means to give each one What they want most with lots of fun, But really, if the truth be known, He wants surprises for each alone." And then the story continues on 3 more illustrated pages like the first card! GOOD SUNDAY MORNING TO ALL OF YOU! I am thankful today for the wonderful family gathering that we had yesterday at our house! We exchanged gifts with daughter's, son-in-law and 3 grandchildren. Bill made gingerbread cookies as well as traditional one from vintage cookie cutters. (I have shared before that Bill was a baker the first 5 yrs. of our marriage and is still the best baker in the house!) We celebrate early because we go to our oldest daughter's house on Christmas Day for dinner and visiting with the rest of the Grandma and Grandpa's, friends and their children. So we get to have 2 celebrations! Please see my post today on the TWO HAPPY blog to see some beautiful paintings depicting Christ's Birth. 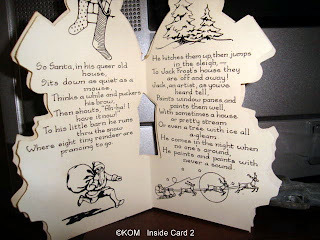 Now I will share with you some Santa Info from the Santa Claus Book by Alden Perkes, Ph.D.S. This is a wonderful book for adults who will get tickled with the information about Santa and for children too. Illustrations of Santa and Elves is humorous and very colorful. 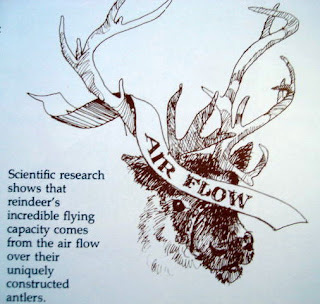 Information includes the aerodynamics of what makes reindeer able to fly and how Santa is able to fly up the chimney from instructions he learned from his Elves! Simply delightful! 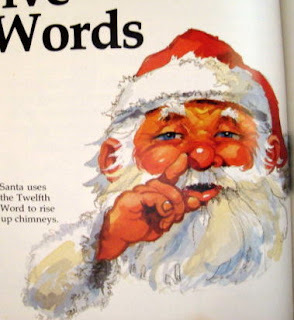 Santa's 12th Magic Word to rise up chimneys: "Huppy Huppy Ho-Ho-Ho! must be said with a broad smile, and with the finger on the side of the nose. Works to make an elf go up into the air. The elves taught this spell to Santa to enable him to go up Chimneys." I love singing and listening to Christmas carols! 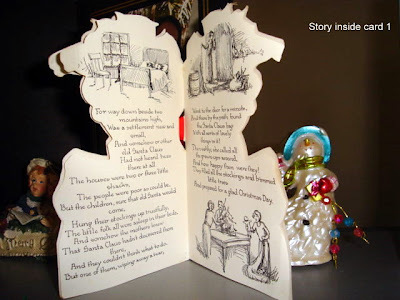 I love the traditions and looked caroling up on line but the legends and history were much too long to post. But you can check them out by just putting in Caroling History and you will find many interesting explanations and information. 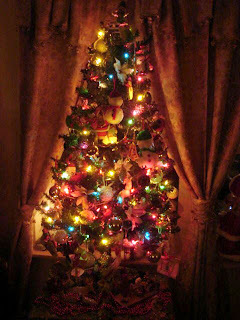 The first carols were sung by the Angels proclaiming the glory of Christ's birth. Among my favorites: Hark the Herald Angels Sing, Joy to The World,O' Little Town of Bethlehem, and many more. I also love the traditional songs of Bing Crosby and Elvis of course! I grew up with Elvis starting when I was twelve-ha! 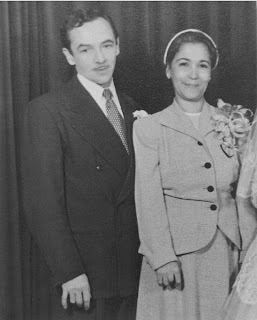 My Mom even loved his voice, his hymns that he sang and would even dance with me to his Rock and Roll songs. 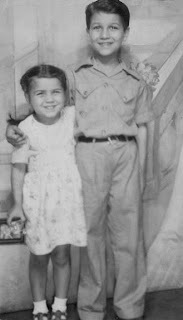 When I was little in the 40's, my Dad always wanted my older brother and I to sing carols for relatives who came to visit during the holidays. He taught us the words to every popular and traditional songs and carols. And we also sang in Latin, "Adeste Fidelis" I have a Caroling book just like the one we had at home with beautiful drawings in it and will have to get it out and feature some of the pages soon! Have a super 9th day before Christmas! "Oh Come let us adore Him, Christ the Lord!" All of the images are of our original woodwork or craft work. 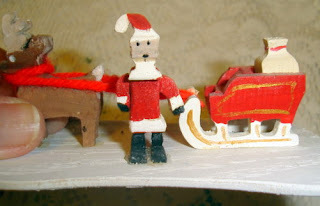 As you can see the little Santa with Rudolf and sleigh is very tiny as is the graduated sizes of Reindeer from tree to tree that Bill has cut out on the scrollsaw. None of these decorations are new. They are all ones we have had through the years. 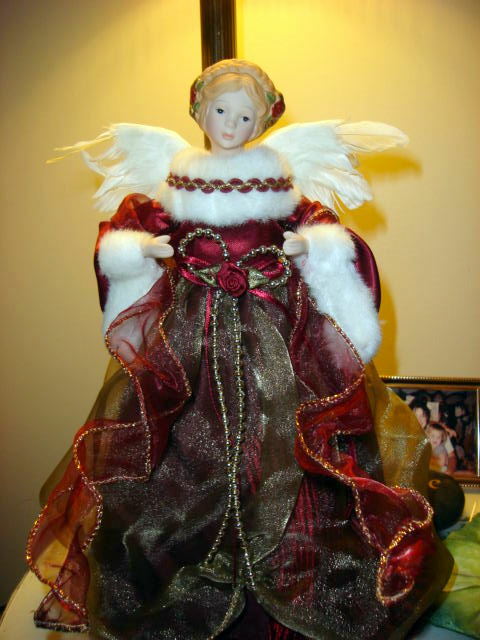 The beautiful Angel is actually a tree topper for our large tree that we did not put up this year but is none the less beautiful by herself on the table. 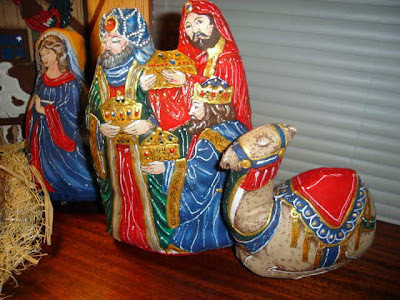 I am featuring the fabric nativity figures again so that you can see more detail. 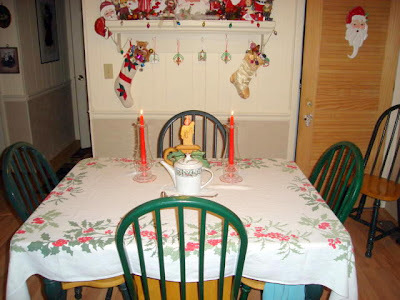 The wooden candle with the flame is one of my favorites that Bill made from a purchased pattern. 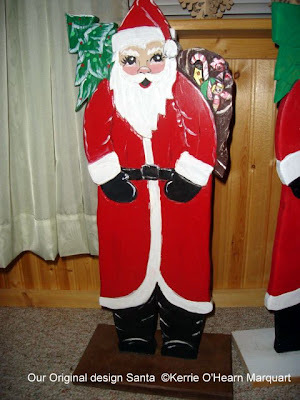 Please visit my Kerrie's Kraft 3 site @ http://kerrieskrafts3.blogspot.com/ to see the post for today of a beautiful and fun Advent calendar for you to make and also directions for a fun candy wreath you can make on a coat hanger. Pattern for the calendar is included and can be printed out. Thanks for looking and do come again and again! 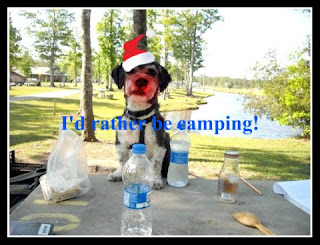 This a pic of our "Grand-Dog", Captain Button who would rather be camping than in the cold weather-ha! HUGE CACTUS! 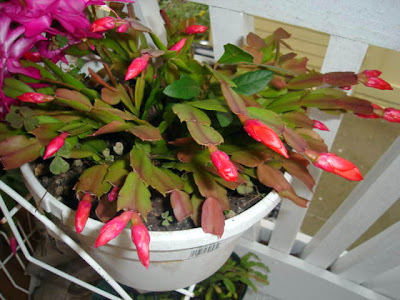 The fuscia color is still blooming and budding and the red cactus is about ready to burst. 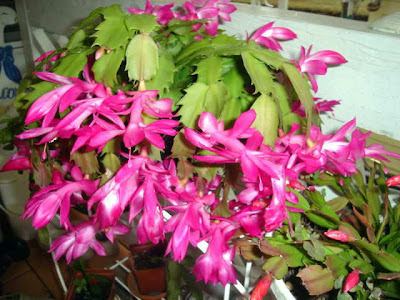 Note that the cactus on the left in the picture has no buds at all yet while the middle cactus is in full bloom and the red one is almost fully open. They fascinate me! Another blogger had asked how I get them to bloom so prolifically and my answer was that I keep them out of doors until it gets too cold. IF YOU BRING THEM IN THE HOUSE IN LATE SUMMER, YOU MUST KEEP THEM IN 12 HOURS OF DARKNESS LIKE IN AN UNUSED BEDROOM AT NIGHT TIME. This will bring the blooms. I leave mine on the porch as I am in SC near the coast and have not had freezing temps yet. 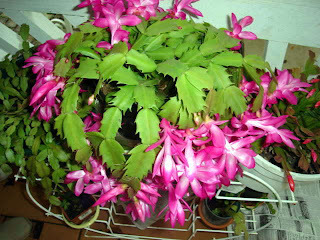 While blooming or budding, I cannot bring them into the house or they will drop the buds from the temperature change. So right now we are enjoying them on the porch here by the den window. 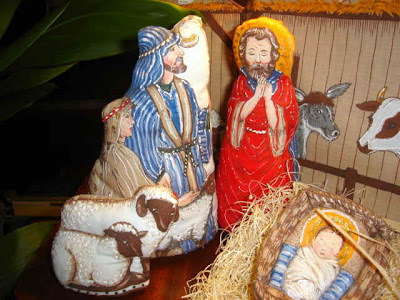 What I learned today about the history of the Creche from Mepkin Abbey, Monck's Corner, SC. 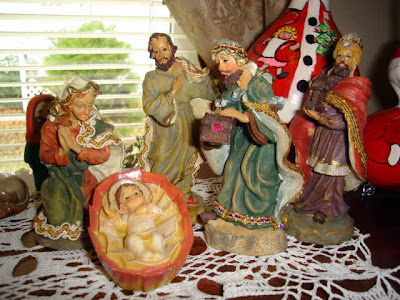 I learned that St. Frances is the one who started the tradition of displaying a creche at Christmastime. He made a scene with real animals and people in the hills to bring people closer to understanding the birth of Christ by actually seeing the likeness of the birth. 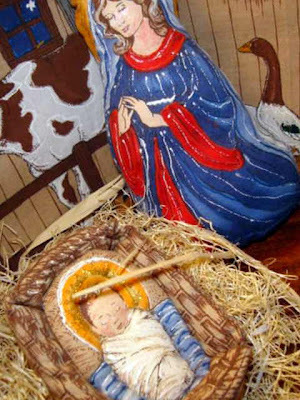 Mepkin Abbey has an enormous display of creches from all over the world at Christmas time. Each ethnic society creates a creche in their likeness and so there are black creches in African dress as well as Mexican, so on and so forth. They are all very beautiful. A friend who goes there often on retreat with her husband, mailed a CD to me so that I could enjoy seeing all the different nativity scenes and figures. I hope that one day when my hubby is feeling well that we might go there in person. The Abbey is very beautiful and peaceful. 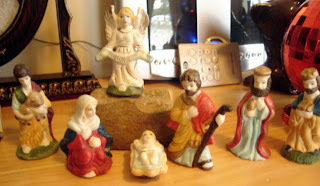 Above are different pictures of some of my little nativity scenes I have collected through the years. 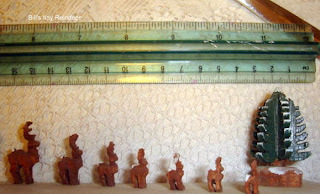 My favorite is the fabric figures that I sewed many years ago and decorated with jewels and beads, etc. 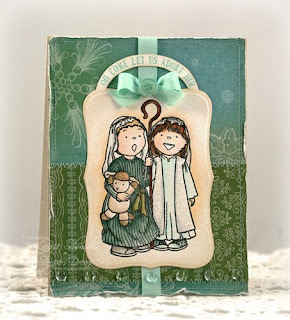 The background fabric has the Christmas story on the back and the manger on the front. It has cardboard inside to create the background screen effect. I love the whole story of Christmas and seeing how other countries portray the birth of our Savior. How do you celebrate your beliefs, I would love to hear!